Seen from Monet’s bedroom, these two imposing trees are yews. They were not planted by Claude Monet: they are older. He found them when he arrived at Giverny. They appear on old photos, although we don’t know of any pic that is from the eighteen eighties. The garden became the focus of photographers after its transformation by Monet and most photos are from the twentieth century. Yews are extraordinary trees. They can live up to 1500 years. 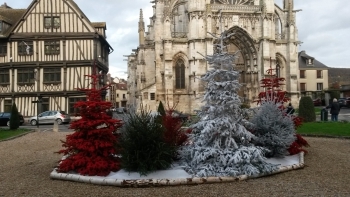 In our region of Normandy they are planted near churches in cemeteries. They were certainly symbolic and magic as well. Chapels dedicated to the Virgin were installed in some very old specimens. It was lovely last week to see the snow covered roof of Giverny’s church. It’s unusual here and never lasts long. 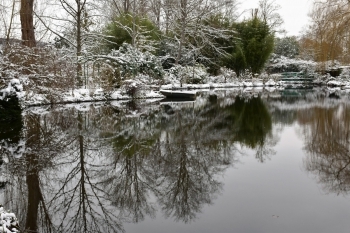 This may be the reason why snow looks lovely for the inhabitants of Monet’s village, because on the other hand it makes life more complicated. As snow is rare, nothing is organized for it, especially transportation. Kids don’t go to school anymore, trucks are not allowed to drive and shops don’t get fresh goods. Fortunately after a couple of days snow vanishes and life is normal again. The little triangular roof you can spot in the distance is the bell tower of Giverny’s church. This cat is crossing the main road, chemin du Roy, without any fear from cars and buses. Sunset is a peaceful time in Claude Monet’s village, just like winter. In French the expression for ‘there isn’t a soul’ is ‘il n’y a pas un chat’, there isn’t a single cat. You could say ‘il n’y a pas âme qui vive’, not a living soul, but it is elevated language. 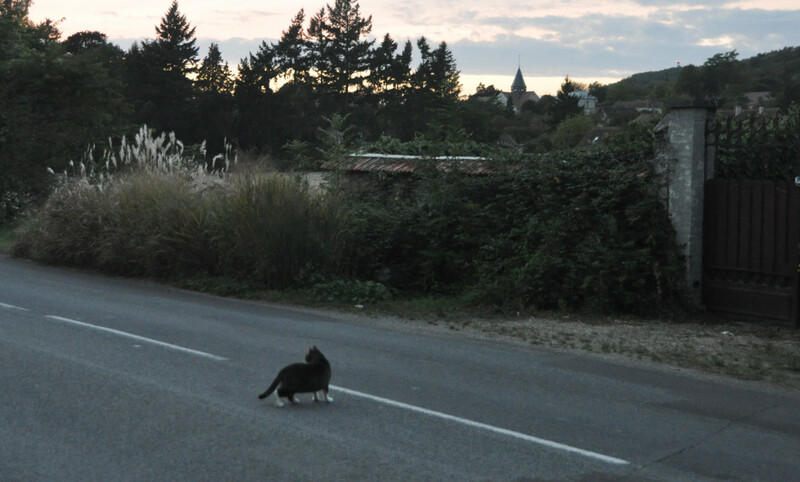 Actually sunset and winter are the best time for cats to live their own life at Giverny, when the streets are theirs again. 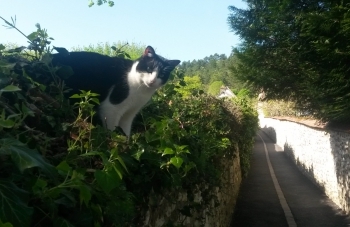 They all belong to somebody – no wild turned cats here, as it may be the case in cities, but cats roaming and exploring their territories. They are wonderful to look at. They are fabulously supple, bouncy, capturing with their eyes, nostrils and whiskers details we have no idea about. They stop unexpectedly in their walk, watching. They jump to the top of the wall, they walk along like a funambulist. 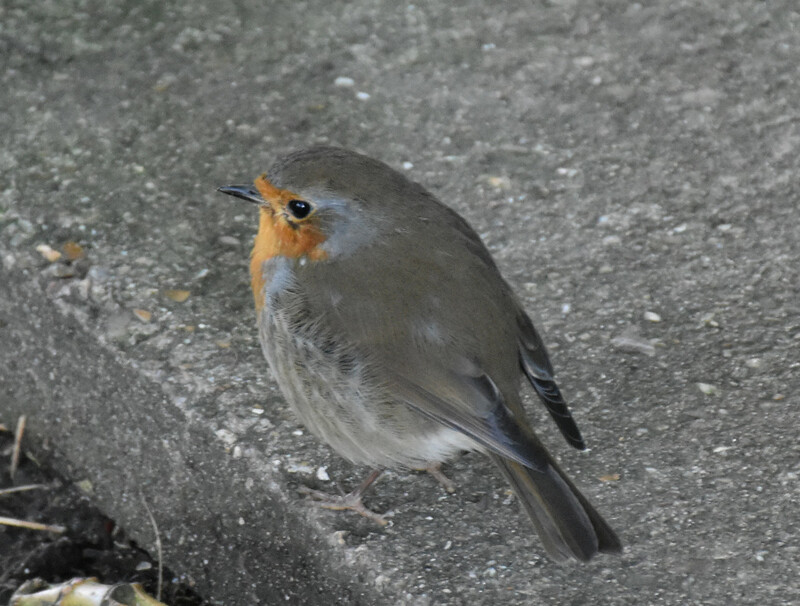 They feel at home everywhere, including in Monet’s gardens. This is why it is inspiring to see these snow-covered fir trees in front of the Eglise Notre-Dame and the tourist information office. Do you like the red ones too? Whether it is mild, warm or ice-cold where you live, I wish you a happy New Year and all the best for you and your loved ones in 2018. Are you curious about flower names? Would you enjoy a picture a day of Giverny’s flowers? 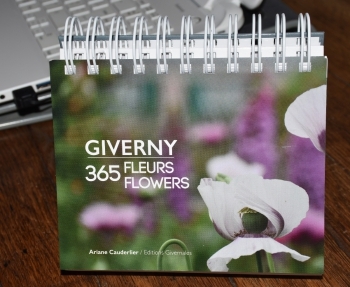 This new perpetual calendar is great to get familiar with the flowers that grow in Claude Monet’s gardens. 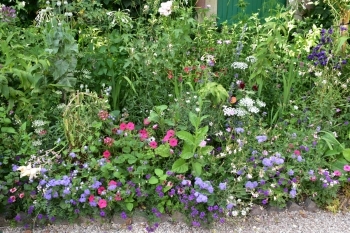 I’ve sorted out my best pictures and identified the flowers with the help of the Giverny gardeners. Botanical name, common name, even French name and photo date are specified for each flower. On some pictures you will recognize the place in the background, just like the poppy picture on the cover. This perpetual calendar is for Giverny lovers and flower lovers alike. The cost is 19 euros + shipment. If you can wait for 2 weeks, the shipment is 4 euros only. Just drop me a comment and I will be back in touch with the details. Giverny has been closed since the 1st of November 2017. Claude Monet’s house and gardens will reopen on the 23rd of March 2018. The last day, I went photo hunting for the last flowers. That’s a special kind of safari, totally harmless but I found it exciting. These roses are my best prey. 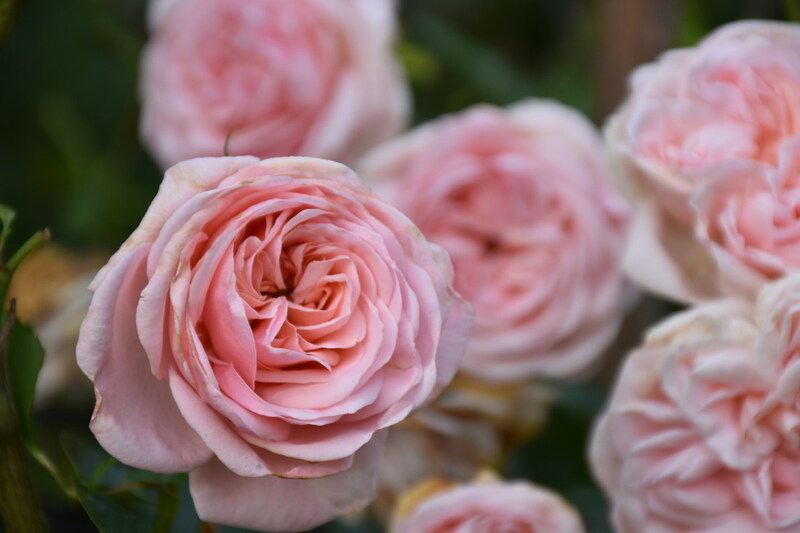 Yes, there are still a few roses in Fall at Giverny, as long as it doesn’t freeze. Sometimes they last up to Christmas. This is not black and white, it’s a color pic of Giverny. In back light the colors disappear on Monet’s pond. They are turned into shades of grey or sepia. The picture resembles a vintage photo. Reducing the colors makes the light look more vibrant. 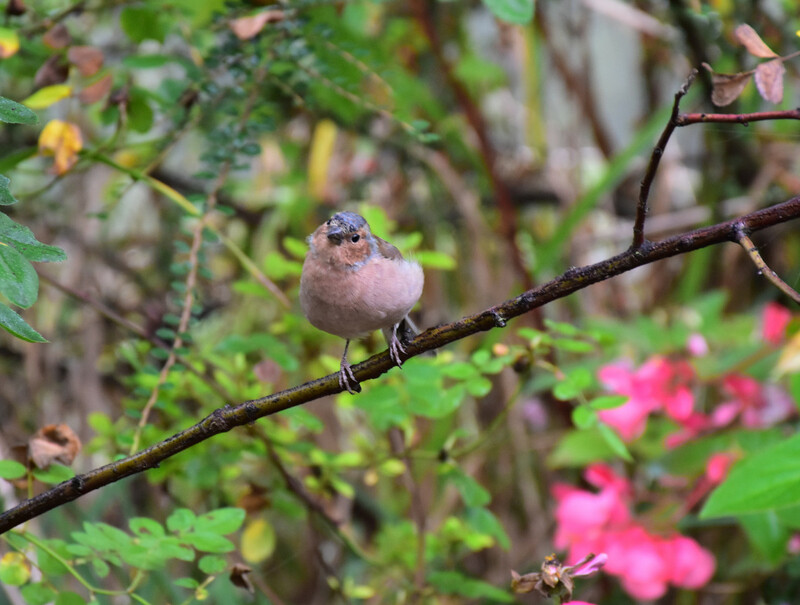 This fat boy is a finch. 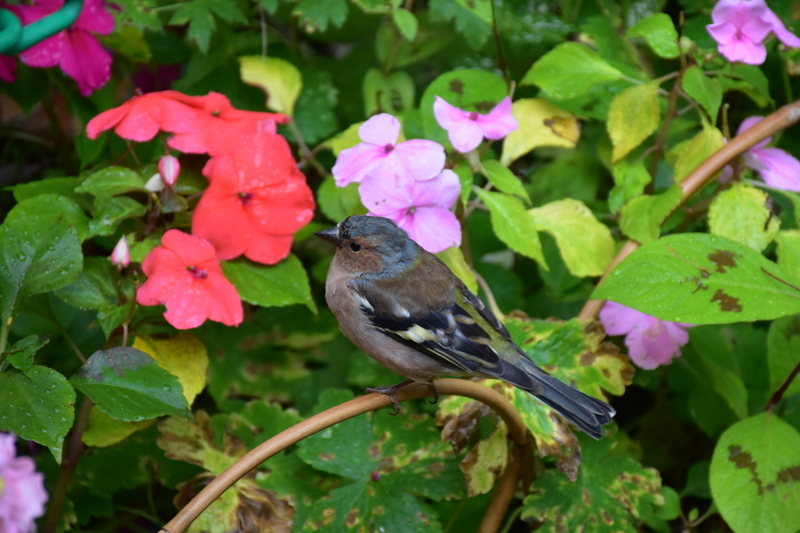 Finches are the most common birds at Giverny. They are easy to recognize with their pink belly and their grey hood. They sing, they hop around, they don’t seem to care about visitors. They live their own lives. Like butterflies, birds bring their own magic into the garden of Monet. Late summer is a feast for the eyes in Monet’s gardens at Giverny. Japanese anemones, among many other flowers, are at their best. Claude Monet grew them along the main alley. He loved their elegant white flowers popping out against a beautiful green foliage. On the photos taken in his times, simple white Japanese anemones can be seen. Nowadays they also exist in pink and can be double or even fluffy. All of them are lovely perennials that last for decades. 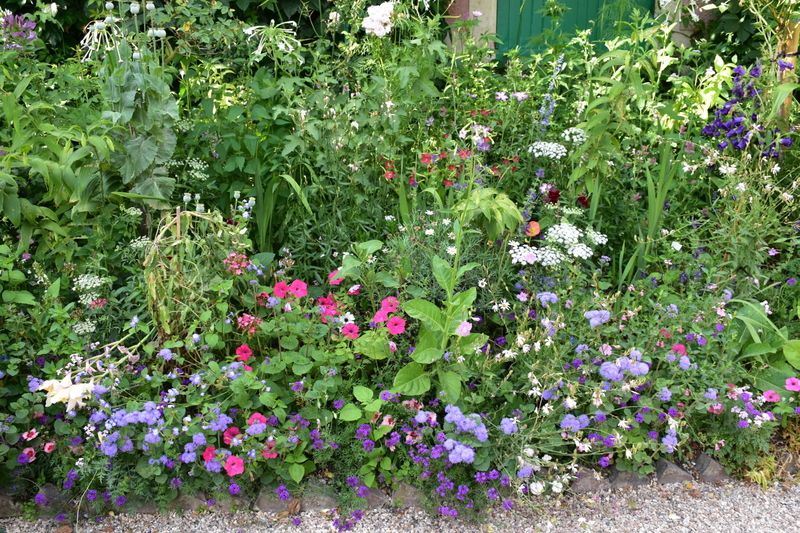 Your border should resemble a living impressionist painting, where petals are used like brushstrokes. Happy gardening! A cash dispenser has been recently installed at Giverny. It is located just after the museum of impressionisms in the direction to the church. On the left side of the picture you can see the school of Giverny in the background. The banking machine is user friendly. The instructions are available in many different languages. I tested it, it works! 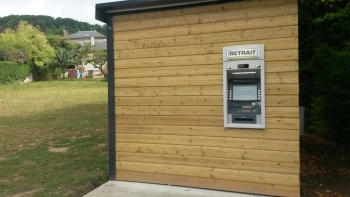 The cashpoint replaces a phone box that is of no use anymore since everybody has a mobile phone. Monet’s garden at Giverny mid-June. Click to enlarge. 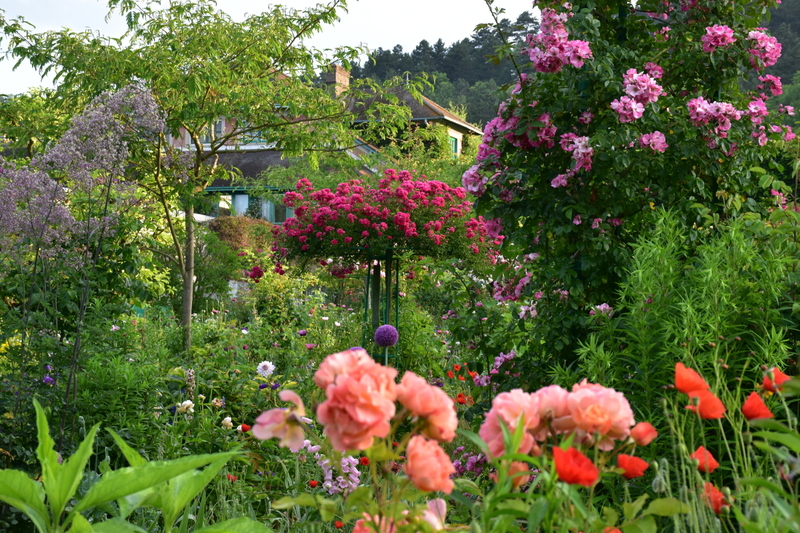 In June, roses blossom in every gardens, and especially in Monet’s flower garden at Giverny. The painter loved to trim them along trellises of all kinds, tripods, arches, or these big mushrooms that are so iconic for Giverny. June is also the time for poppies and alliums, the big round shaped garlic flowers. Not to mention the huge pigamon, aka thalictrum aquilegifolia, that looks like mauve powder. The garden is full of pinks, reds and purples. Summer will turn it yellow. Can you see the big leaves in the foreground of the pic? Sunflowers are growing now, to surprise visitors with their dinner plate golden flowers in a month. Is there fish in Monet’s pond at Giverny? This is a question visitors ask frequently. 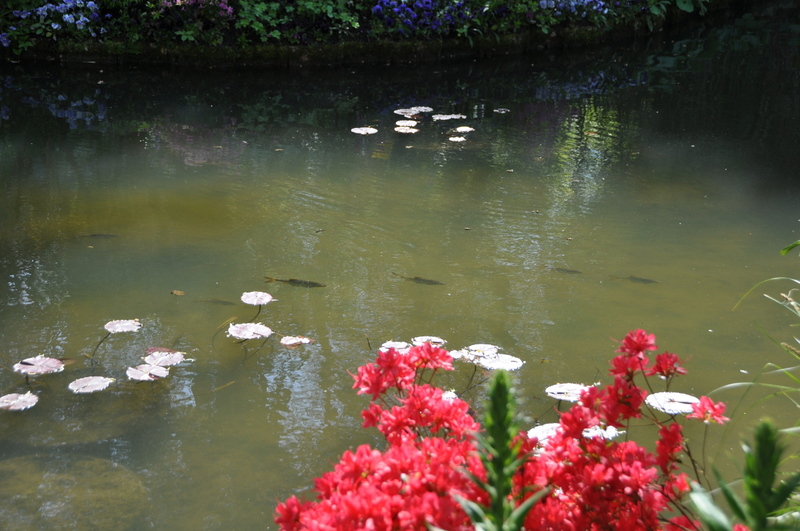 The water lily pond houses a few big carps, maybe eight according to the gardeners. There are also smaller fish like ruds, that have orange fins, and at least a perch and a pike. All of them are wild fish that can be found in streams nearby. They contribute to the ecosystem of the pond and are invaluable to keep this little microcosm balanced. 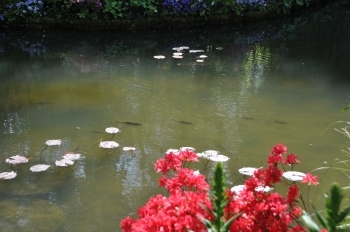 The Giverny fish are greyish, silvery, but not colorful. No koi carps here, although they would add to the oriental look of the garden. 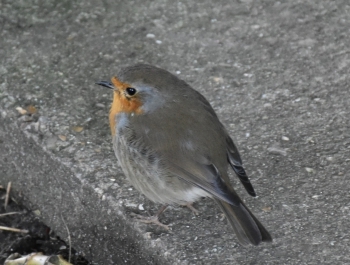 As mute as they may be, they are visible enough for the heron that visits the pond at dawn. The water is too deep for him to stand in it, but he stays on the side and keeps a close eye on the fish, hoping one will come near enough to be turned into his breakfast.